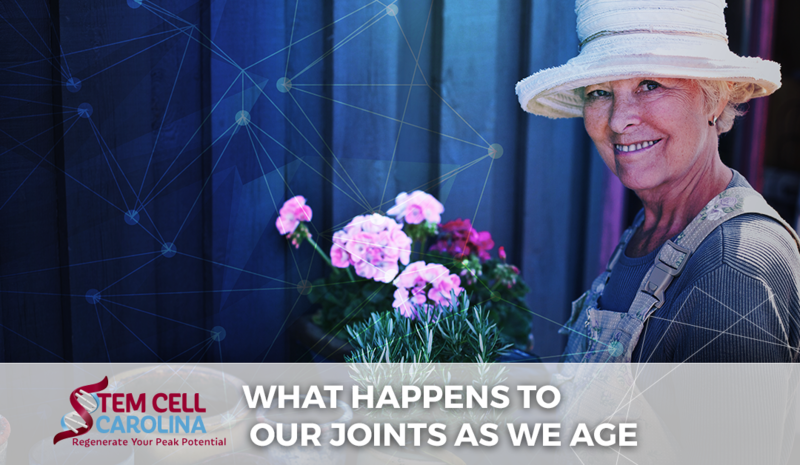 As we age, a lifetime of stress and use (or misuse) of our bodies, combined with natural deterioration causes changes in our joints that can lead to a host of problems and pains. Here, we will talk about all of the factors that contribute to joint deterioration as we age and what you can do to slow or avoid the process. Sarcopenia, or loss of muscle, naturally begins around the age of 30 and continues to progress as we age. The amount of muscle tissue and fibers gradually decrease throughout life. While muscles are not exactly part of our joints, they are the structures that help support the joints. When the muscles above and below the joints are strong, it helps support the joint structures. When the muscles begin to atrophy (waste away), it puts more stress on the joints by forcing the body to use joints for more movements that muscles should do (bending, lifting, support). Continuing to strengthen and build muscle throughout the duration of your life can help slow the deterioration, prevent it altogether, or even reverse sarcopenia. No, you don’t have to be a powerlifter, light to moderate cardio and strength training is enough! As we age, our cartilage (joint cushions) begin to thin. 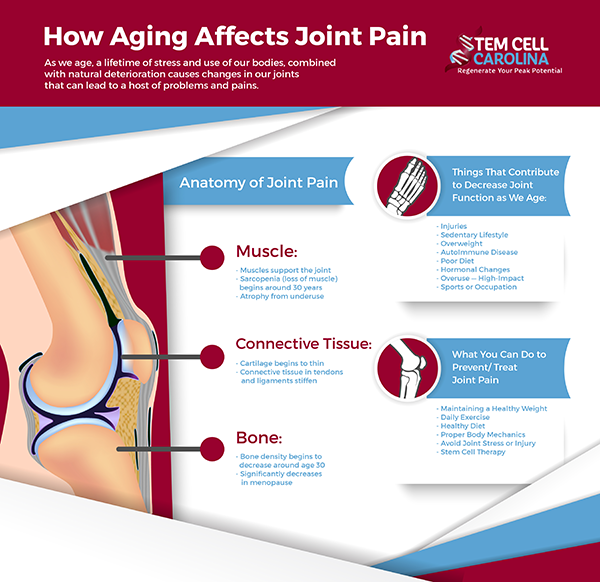 This is caused both by a natural phenomenon when the proteoglycans (the substance that makes cartilage resilient) alters and due to high-impact stress the joint faces over a lifetime. Connective tissues within the tendons and ligaments become more rigid and brittle over time, which limits the range of motion and makes movement more uncomfortable and difficult over time. Since it is primarily the tendons, ligaments, cartilage, and connective tissues that make up joints, when these tissues suffer degenerative changes or injury, the joint becomes compromised. As we age, the healing process slows and recovery time lengthens. To help slow or prevent these changes, it is important to not cause unnecessary stress on your joints and to continue to support your connective tissue by keeping it active. At around age 30, bone density begins to diminish, and for menopausal women, bone density loss can significantly increase. As bone density decreases, the bones become more fragile and are more likely to break. Bones contribute to joint health and pain by providing the structures between where movement takes place. Brittle, weak bones can cause the other tissues of the joint to break down due to a lack of a support structure. Fortunately, bone loss can be slowed or prevented with hormone or nutritional supplements and low-impact exercise. Many people assume that joint pain is a natural part of aging, that it is a symptom that is expected and we should just endure it as a normal part of life. However, that just is not true, there are many things we can do to prevent joint breakdown. For instance, maintaining a healthy weight and participating in daily exercise, consuming a healthy diet, and using proper body mechanics to avoid joint stress or injury can help. However, if you are like most people, and reading this article too late, and already suffer from chronic joint pain, contact Stem Cell Carolina to find out how our stem cell treatments can help your joints recover and get you back to a pain-free life!